We didn’t take a photo of the team during the Fall Division 1 season of the Austin City League. I’m partially to blame for that. In any case, we played a friendly match today, a few weeks before the summer season starts, against a team from some chinese church (I’ll try to find more details about them). 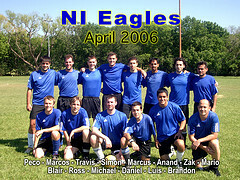 The NI-Eagles won 3-0. Here’s the photo of the guys who made it to the game. Click for larger version. Hi. I was searching in google images for any bday pic that would catch my eye and in doing so i found an old post of yours. It was posted back on May 9, 2004 and it in regards to your bday. Back then you mention not having any readers and nobody knowing your special date (of course outside of family i imagine) ….i was actually going to leave you a message right there but i thought best to see if you were still blogging. So you are and so i would like to wish you a very belated bday. As belated as they go considering it was almost 2 years ago. And since i got your attention, i would take this opportunity to wish you a great bday 2006. I hope that you don’t feel anything but joy in your special day. BTW-good luck in your season (soccer) coming up. Do you realize how many of your post i have just read? Yikes-and i was going straight to be or so i thought…. You have a great blog here. Don’t be discouraged by the lack of comments. You are doing a good job of writing interesting and fun posts. I wish you the best and may the whole world come to visit your words. Nice photo. Thanks for publishing this and playing a great game Marcos.